Home > Animal Free Clothing > No, You Don't Have To Wear Leather Shoes! Vegetarians often wonder about whether they should wear leather products. People often assume that leather is a by-product of the meat industry and since cattle will die anyway for the meat, there's little harm in wearing the leather - if you're not the one buying the meat. In fact leather products from many different animals - kangaroo, for example, is used for some football boots and trainers. The leather that does come from cattle is not always from those cows nearing the end of their lives. Almost all cattle are killed prematurely, often as calves. Calf leather is very soft and highly prized. The softest leather comes from unborn calves, which die when their milk-producing mothers are killed. So there is an argument for saying that vegetarians should avoid leather as well as meat. Even so, for years our parents told us we should always buy leather shoes if possible, because they are good for our feet and better than plastic. These days, developments in modern synthetic materials mean it's no longer true that only leather shoes allow your feet to breathe and therefore prevent foot problems. 'Vegetarian' shoes are now abundantly available and they come in all sizes, shapes, styles and colours. Whatever kind of shoe or boot you like, there will be one available in a non-leather shoe option. The problem for vegetarians is finding them. For many shoe shops, the majority of their shoes are made from leather, and those that aren't can be a bit cheap and nasty. If you want a good quality 'vegetarian' shoe, you may need to look online. There are several mail order firms in this country with a huge array of non-leather shoes and boots that look as good and as stylish as their leather counterparts. There are a few specialist vegetarian shoe shops dotted around the country as well, but if you're not local, mail order may be your best bet. Many of the materials available for vegetarian shoes are no longer just oil based plastics, but more bio friendly, plant based materials. Vegetan is a leather alternative, which comes in a range of different grades of thickness to make some great styles of boot and shoe. It's breathable, water resistant, easy to clean and between 70% and 80% biodegradable, ideal for vegetarians. A tougher version is Vegetan Micro, which offers vegetarians a high quality leather-type performance for hard wearing shoes or hiking boots. If you like the feel and look of suede, it's possible now to buy a stretchy non-leather shoe in suede which is also breathable, elasticated and feels soft to the touch. Non-leather shoes also come in a range of other fabrics including Birkofelt, Birkoflor, and Microfibre. It's even possible to buy 'retread' sandals, the soles of which are cut from old car tyres! Nubuck is a popular leather product for shoes and there are many shoes of all styles available in imitation nubuck. Don't forget, as a vegetarian you don't have to resort to new materials for your non-leather shoes. 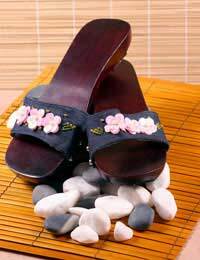 Flip-flops can look great and are often plastic with rubberised soles. And canvas makes a great pump or plimsoll. Don't be afraid to steer clear of leather products when looking for your next pair of shoes or boots. Non-leather shoes no longer look cheap and ugly, or make your feet sweat. Keep an eye out for some fantastic new materials and fabrics that look stylish, are good for your feet, and great for your vegetarian conscience.